Friends make fitness way more fun! 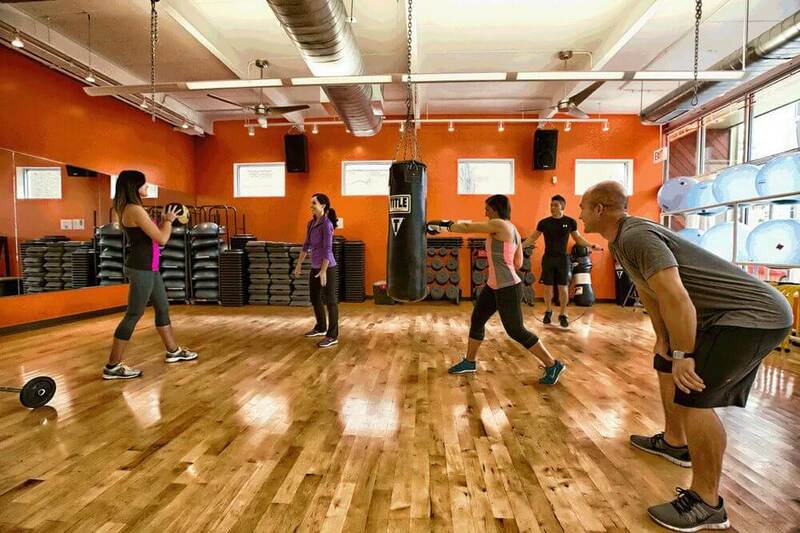 Our semi-private, small group training sessions are a GREAT way to make new fitness friends! These programs offer the benefits of a personal trainer in a focused setting and the motivation and encouragement of a team of other fitness fans, a great social solution to your fitness goals. Think of it as a fitness cooperative, where everyone benefits. All fitness levels are welcome to CAC’s Bootcamp – a class that has been specifically designed to integrate genuine boot camp training workouts with the support and motivation of a team. The workouts are stimulating and each workout is unique. Learn more and register for LPAC Bootcamp here. Fit Females is an eight week semi-private strength and fitness small group training program. Our max member size in the program is six members so you will receive the benefits of semi-individualized training and the increased motivation and accountability of being part of a group. The focus of the workouts will be total body strength circuits to maximize your success during the 8 week program. Register for LPAC Fit Females here. More than just a normal workout program, this high volume training program is designed to build serious muscle and burn fat at the same time. Next sessions begin in March! If you're someone who is interested in seriously progressing your fitness routine, educating yourself on proper weight lifting form and movements, and looking to expand your social circle of fellow fit females at LSAC, #girlswholift is an incredible opportunity to jump-start ALL of that. Swing, press, squat and turkish get up at LSAC's kettlebell small group training program. This small group program is designed to deliver a workout that will get you stronger while burning calories. Prior kettlebell experience is always great, but not required to participate. Our team has gone through the most respected kettlebell certification programs in the country, including StrongFirst and MBSC. We've designed an 8 week course that builds on basic kettlebell skills, with an emphasis on overarching strength and movement principles, so you can confidently use the kettlebell in your personal program. This program is designed to increase both cardiovascular and muscular endurance. Using a ladder system, this program strings together exercises starting from least to most challenging to create each circuit. Register for LSAC Progression Session here. During this class you will be pushed to the limit and recognize your true strength and power. Learn to trust your body and your form through lifting heavy weights while mixing in cardiovascular training as well. Next session starts March 19th. Register here. A tabata is a high intensity program that research has repeatedly shown sheds pounds, increases muscle tone, and improves cardio vascular health. Each workout will have a unique approach to incorporating the tabata technique, keeping every session fun, challenging and effective! Register for LSAC Tabata Challenge here. This program focuses on the building of lean muscles and cardiovascular strength utilizing the TRX ropes and various other equipment. Body fat assessment, body circumference recording, and take-home programming accompany the weekly class. Learn more and register for TRX Bootcamp here. Barbell Club is a progressive program that will help you build lean muscle, improve strength, and burn fat using a variety of exercise equipment such as barbells, dumbbells, and cables. Each session is one hour long and consists of a warm-up and workout. Stretching will be after the workout if time permits. Each program is split into six week cycles. Each of the assessments below are completed every six weeks to gauge progress. 3-5 rep max tests (deadlifts, squats, chin-ups, bench, and overhead press). Learn more and register for BAC Barbell Club here. Strength Squad is a progressive training program in a small group setting. We combine effectiveness of working with a personal trainer and the motivation of teammates. The program is easily tailored to your specific fitness needs and goals. Each week focuses of different exercises to help reduce body fat, increase strength, improve mobility, build endurance and make you feel great. All fitness levels are welcome! No matter what your fitness goals may be, Strength Squad is for you! Learn more and register for BAC Strength Squad here. Register for WAC Beginner Kettlebell here. All fitness levels are welcome to CAC’s Bootcamp – a class that has been specifically designed to integrate genuine boot camp training workouts with the support and motivation of a team. The workouts are stimulating and each workout is unique. This progressive, full-body program combines resistance training, coordination, high-intensity cardio drills, core training, and metabolic conditioning intervals to help you reach your fitness goals. Regular assessments that include tracking your measurements, weight, pushups, timed planks and timed runs are performed to gauge your progress and motivate you in achieving your fitness goals. Register for WAC Bootcamp here. Register for Webster Place Bootcamp here.